Radyo Bahá’í (Bahá’í Radio) is a community radio station that focuses on the communications media as a tool in the advancement and acceleration of the educational process that leads and contributes to the transformation of society, particularly the spiritual and material culture of populations. Radyo Bahá’í promotes positive social change by providing the various communities that it serves with access to knowledge that have been identified by these same communities as necessary to uplift themselves and advance their community’s spiritual, cultural, social, and economic development. Its initiative to participate in consultations with those they serve in the communities enables the station to recognize the kind of information the populations need and reflects it in the programs they develop. Radyo Bahá’í aims to contribute to a prosperous and just world civilization created by vibrant communities based on spiritual principles. The station, through its activities, assists communities within its service area, to achieve a dynamic coherence between the material and spiritual aspects of life. Radyo Bahá’í ensures that individuals in these communities have access to knowledge that empowers them to live lives that are based on fundamental spiritual and human values, and are inspired by and oriented to the Divine. With the desire to make radio as a tool in the development and progression of the learning processes of children, junior youth, youth and adults, Radyo Bahá’í designs its programs based on building the spiritual and material capabilities to contribute to the transformation of the society they live in. DWBR- RadyoBahá’í (Philippines) was officially inaugurated on 26 November 2002. 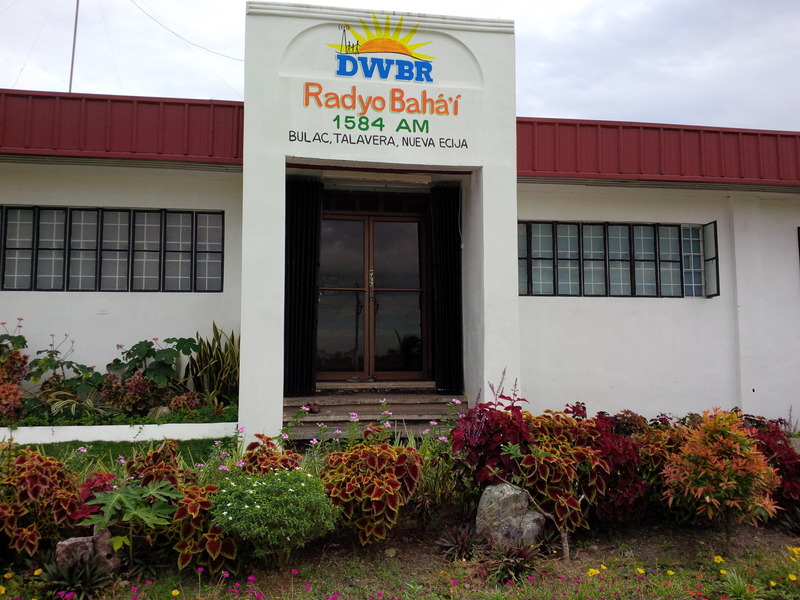 The station operates at 1584 kHz on the AM frequency, broadcasting at a power of 1,000 watts from its studios located in a small farming village at #271 Zone 1, Barangay Bulac, Talavera, Nueva Ecija. The flat topography of the region enables it to reach a wide area encompassing a 90 kilometer radius covering the entire province of Nueva Ecija and portions the provinces of Tarlac, Bulacan, Pampanga, Aurora and Pangasinan, with a potential listenership of more than 2.3 million people. Its programs include disseminating information on culture, health care, farming and other topics on development . It s major programs are interspersed with radio plays, songs that are locally composed and produced, and quotes and prayers from the Holy Writings set to music. Radyo Bahá’í also engages in news and public affairs and airs public service announcements and greetings. Radyo Baha’i is a member of the Kapisanan ng mgaBrodkaster ng Pilipinas (KBP) and the Central Luzon Media Association (CLMA).